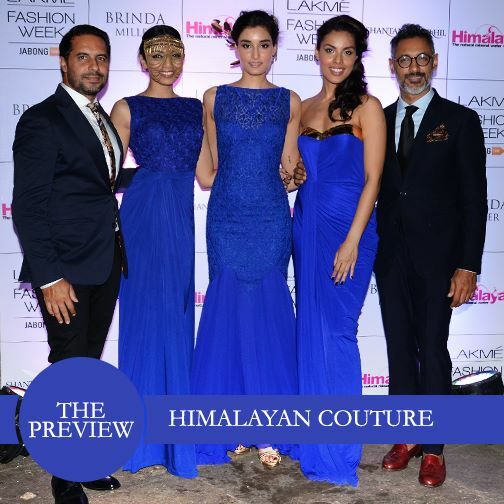 On Monday evening, Shantanu & Nikhil in association with Himalayan Natural Mineral Water presented a preview of their ‘Himalayan Couture’ collection at Bungalow 9, showcasing beauty, fluidity, grace and fierceness of the majestic Himalayas. The ‘Live Natural’ brand positioning for Himalayan finds resonance with sensibilities of the latest collection by the designer duo. Using primarily fluid fabrics, the collection is quietly glamorous, with creative architecture & intriguing fabric cut-outs that balance a palette of greys, whites & blacks. The Himalayan Couture collection will be presented on the 23rd of August at the Lakmé Fashion Week Winter/Festive 2014 at Palladium Hotel, Mumbai.